You may have taught your grandmother how to send a text message. It’s possible you even helped your father craft his first email. But eye rolling and snickering at your techno-phobic senior relatives aside, it turns out we may not be quite the digitally savvy generation we thought we were. According to data from Equifax Canada, 50 per cent of suspect and highly suspect credit application frauds in 2015 were against Millennials. The next most targeted were Generation X-ers, at a much lower 29 per cent, while Baby Boomers were in third place with 17 per cent. Only three per cent was attributed to the Silent Generation (those born between the mid-1920s and early 1940s). Of the 15 million credit card applications Equifax receives a year, about one per cent of these are highly suspect or suspect fraud attempts. So to learn that we’re accountable for half of all of these is a little concerning. 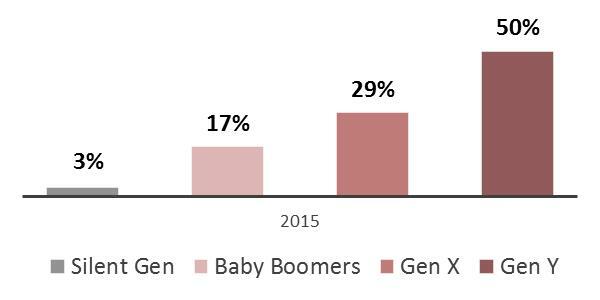 And while we can hardly be surprised that the most senior age category is rarely being targeted, it’s a bit of a shock to realize just how susceptible millennials are. Sure, we can’t exactly remember the last time we put our phone down for more than five minutes either – but we had hoped that we were vigilant enough when it came to the serious stuff. But perhaps sharing isn’t really caring? Equifax also worked with Leger to produce a survey that spoke to 1539 Canadians about financial fraud and the perceptions surrounding it. More than half of Canadians (53 per cent) said that they have been the victim of some kind of financial fraud. By age, Millennials came a close second in this category, with 56 per cent saying they had fallen prey to attempts by fraudsters. One third of Canadians have experienced the unauthorized use of their credit or debit card, and by province Alberta was found the be the most unlucky, with 42 per cent. B.C followed closely behind with 41 per cent, while Ontario was in third at 38 per cent. Millennials were much less likely than Canadians 35 years and older to feel vulnerable to fraud when paying for things online with their debit card or sharing things on social media. And it seems that we have a bit of an inferiority complex, as our generation was also more likely to believe that we didn’t have enough money to attract fraudsters. Or maybe we’re just too trusting. Millennials were the least likely to frequently double check bank and credit card statements or limit the number of purchases made online. We were also less likely than anyone to carry cash as a primary means of spending, relying heavily on plastic instead. And we sure are a patronizing bunch. Millennials (and all other age categories) believed that those 65 and older were the most vulnerable to financial fraud, and we also deluded ourselves in thinking that Gen X, Y and Z were all the least susceptible to it. Since our generation has now become the ideal target for fraudsters — while simultaneously growing a little arrogant and self-unaware about the topic — perhaps we should swallow our pride and ask those poor old dears to give us a little advice of their own.